1) Set broiler on HIGH. 2) Pour 1/2 tablespoon olive oil in large bowl. Season with salt & pepper. Add carrots and toss to coat well with oil and seasonings. Spread carrots in a SINGLE LAYER on one baking sheet. 3) Combine remaining 1/2 tablespoon olive oil in same bowl, and season with salt and pepper. Add green beans and toss to coat. Spread green beans in a SINGLE LAYER on second baking sheet. 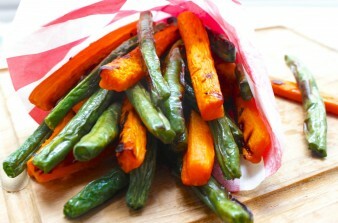 4) Broil green beans for 6 minutes and carrots for 8 minutes (or until vegetables begin to turn brown & crisp). Turn once half way through broiling. 5) Served best right out of the oven. Looks so delicious!! I make my green bean fries with haricots verts (the skinny kind) and roast them at 450….will definitely have to try broiling them next time! You made the perfect Super Swap RATIOS…salmon + brown rice + green bean/carrot FRIES! Yeah baby! So glad you enjoyed them. xoxoxo Fry-tastic.